Darth Vader has me in the Death Grip. The 6ft 7" giant who commanded the evil Galactic Empire, wreaking havoc on the entire universe, squeezes my slender hand with a cast iron fist. 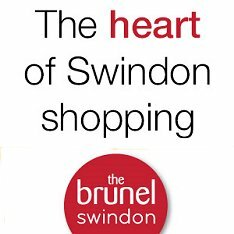 "It's great to be back in Swindon," he says in his warm Bristol tones. "I haven't been for about fifteen years but I really like the place". 2005 is to be a huge year for Prowse, who admits he's fully booked until July. The imminent release of Episode III: Revenge of the Sith will see the infamous villain he embodied for three of the most successful movies of all time rise once again. But former body builder Prowse was far from prepared for the global phenomenon that Star Wars would become when he started working on the film. "To be perfectly honest I thought it would be a load of rubbish. Although we'd all read the script it didn't make much sense. Plus I couldn't see where I was going on set and my eyepieces kept misting up so I was constantly taking the helmet off! The only thing I could appreciate at the start was how much money had clearly been spent on the sets - they were phenomenal." Even the now infamous light sabre duels had modest beginnings. "Originally they tried to make a light sabre that worked, a carbon fibre dowel coated with reflective tape around a revolving motor," recalls Prowse. "But every time I hit Alec Guinness with them they used to break! We spent more time picking the pieces up off the floor than we did actually filming!" Prowse, now in his seventieth year, is more than happy to talk about the movies that catapulted him to fame and caused a fan frenzy that has never since died down. 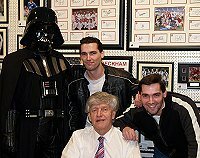 Although Vader was a collaboration of three different actors in the trilogy, Prowse signs memorabilia 'Darth Vader' and most, including James Earl Jones who provided the voice, are in no doubt as to who is the real Lord Vader. In fact Prowse, who spoke every line of dialogue throughout Star Wars, fully assumed that his voice would make the final cut. "I kept saying to George (Lucas), 'what are we going to do about dialogue?' and he would assure me I'd be able to rerecord it in studios after filming. Then I didn't hear anything until the film came out in America with this huge blaze of publicity. The next thing I knew I got a cable from famous director Russ Meyer, who I'd done a film with, saying 'Congratulations Dave, you're in the biggest movie of all time. And by the way, they've dubbed your voice!'" Prowse was never told why, although one assumes American audiences weren't quite ready for a Dark Lord with a West Country accent. 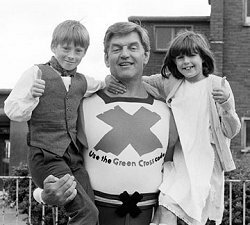 Despite having worked with such silver screen legends as Alec Guinness, George Lucas, Stanley Kubrick, Peter Cushing and Christopher Reeve (who he trained for Superman), Prowse is most proud of his work as the Green Cross Code Man. Honoured with an MBE for Services to Road Traffic and Charity in 2000, he had a huge part in cutting the number of road deaths amongst children in the UK and beyond. "In 1976 they studied the road accident figures and found out that, despite ads starring Kevin Keegan, Joe Bugner and Alvin Stardust, they were actually going up. So I decided to revamp the Green Cross Code, with a Superman-like figure who would actually preach the four key sentences. "To test the character I dressed in white cricket flannels and a black sweater with a white vest on top and a Green Cross on it and took to the streets of Clapham, posing for loads of photos crossing roads, holding hands with kids. "To my surprise, little old ladies would keep coming up to me asking for me to help them! So I had to say, 'I'm not going to be here forever, it's just for the photos!'" 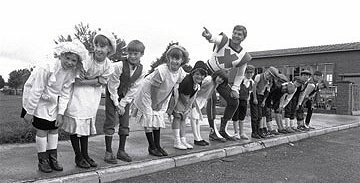 The resulting advertising campaign turned out to be a huge success and Prowse soon took his superhero around fifteen schools a week for fourteen years. But he nearly had to turn down the opportunity before it began. "The agency was desperate to get started with the commercials in 1976, but I was working on Star Wars. I told them I couldn't tell George Lucas he's got to release me because I want to do Green Cross Code commercials. But eventually they gave me an ultimatum, saying they'd recast if I didn't do commercials by September. So I went to George and told him I had the opportunity to become the figurehead of a government safety campaign, and he agreed to give me the week off and reschedule shooting!" But were kids willing to trust Darth Vader to help them cross the road? "Actually, the Department of Transport were at one stage going to sack me," he remembers. 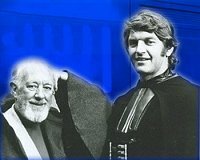 "When Star Wars came out in 1977 they suddenly realised the Green Cross Code Man was the evil villain and got cold feet. But it turned out that Vader was an icon who the kids thought was wonderful, so the campaign became much more successful because of Star Wars." Asked what the Green Cross Code man would make of Swindon's daunting traffic jigsaw the Magic Roundabout, Prowse says it's just fine. "As long as you know where you're going you can manoeuvre around it quite easily. I wouldn't attempt to guide children across it though!" So with just three months until the biggest film franchise in history comes to its momentous conclusion, what does the original Lord Vader think of the prequels? "Not much to be perfectly honest! I thought The Phantom Menace was terrible, except for the Pod Race. I can't get my head around the fact that the technology of the first two movies, which are forty years prior to Star Wars, is so much better than any technology they had in Star Wars! "I've seen the teaser trailer for Revenge of the Sith though and I think it will be excellent." 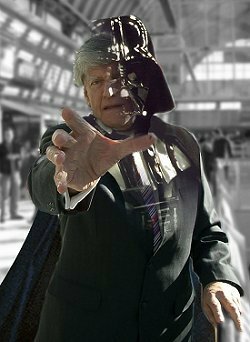 And with that we leave gentle giant Dave Prowse to face the legions of Star Wars fanatics queuing on the first floor of the Brunel Centre: a prospect perhaps more frightening than the Rebel Alliance itself. Interview conducted at the former Infinitely Better Memorabilia Store in The Brunel Centre, 19 January 2005.